I completely identify with the sentiment in that song every time my alarm goes off on a weekday. I would love to snuggle up in my bed a little longer and then leisurely get up, stay in my pajamas and have someone make me banana pancakes. Doesn’t that sound perfect? While it may not be very practical to sleep in and stay in your PJs every day, with a recipe this quick and easy to throw together (even on a weekday morning) you can have your banana pancakes and pretend just a little. I used a nice, ripe, sweet banana and since there’s already syrup in these pancakes, it was the perfect amount of sweetness for me. Not too much, not too little. If you’re jonesing for a little more syrup though, you could always serve some on the side for dipping or drizzle a little more over the top. 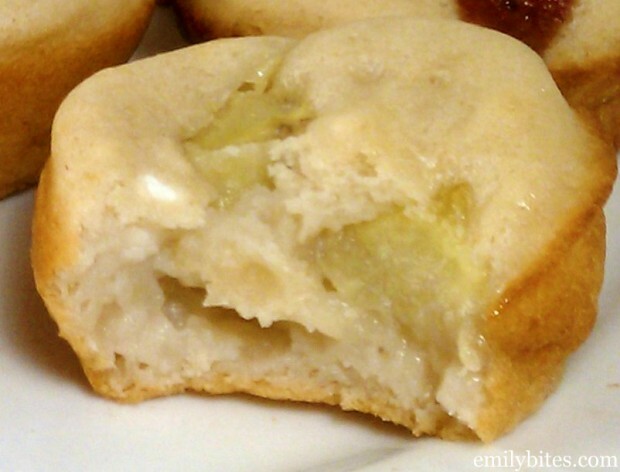 I actually made a few of these with bacon or breakfast sausage in addition to the banana bites, but I thought the banana ones were by far the most delicious. In case you’re wondering, three strips of cooked turkey bacon or two Wegmans chicken breakfast sausage links can be exchanged for the banana in this recipe and it does not change the Weight Watchers Points+ value. I will definitely try these again with other fruits, especially blueberries. I think I see mini chocolate chip pancake bites in my future as well. Any of your favorite pancake mix-ins should work! I love that these are only 1 Weight Watchers SmartPoints each – I got to eat a handful of light, fluffy banana pancake bites for very low points. Get creative and if you come up with any other amazing mix-ins, I’d love to hear them! Pre-heat the oven to 350. Lightly mist a 24 count mini muffin tin with cooking spray. In a large bowl, stir together Bisquick mix, milk and syrup until thoroughly combined. 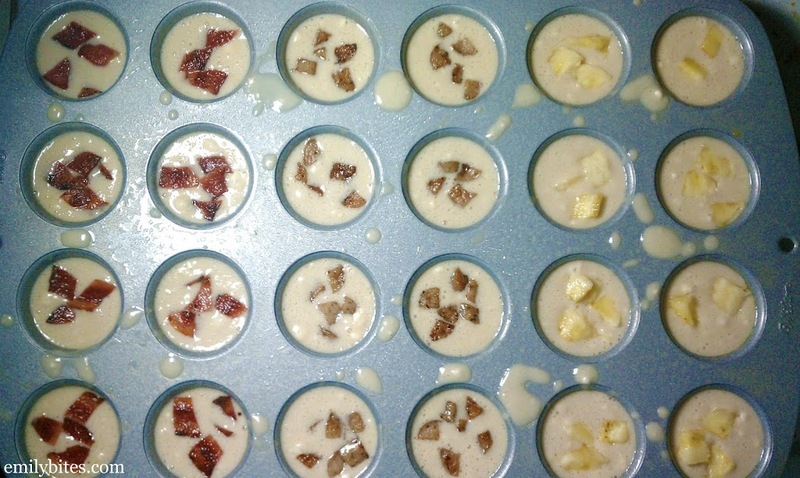 Divide the batter evenly amongst the prepared mini muffin tin cups. 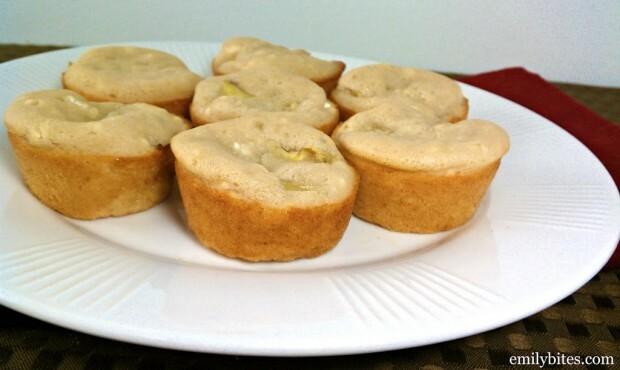 Sprinkle the chopped banana pieces over the tops of each muffin cup. Bake in the oven for 12-14 minutes until golden and cooked through. Mm these sound delicious. Also btw, Jack Johnson “Banana Pancakes” is my alarm song as well! Maybe honey or agave nectar? You could probably find other flavored syrups too that aren’t maple or pancake syrup flavored. The type they put in fancy coffee drinks? Caramel or a similar flavor would work if you like that. Do these keep well in the fridge or freezer for a quick breakfast throughout the work week? I just made them this morning so I’m not really sure! I’ve never frozen pancakes before, but they should keep okay in the fridge for a few days. Since they only take a few minutes to put together you could always make a half batch a couple times a week if they end up not keeping well. Hope that helps! i have been pre-making and freezing pancakes for 2 months now…they heat up in the microwave perfectly also! so i think freezing these would work just as well!! Glad to hear they were yummy with strawberries! We had these for breakfast this morning and my kids and I all loved them! Mine only made 16 though, not 24, but that’s ok, maybe I filled the cups too full. This will definitely make my breakfast rotation though! Happy to hear they were a hit! I tried the banana and sausage ones. I made them in a full size muffin tin and they were amazing! This was an easy quick recipe with great taste! Thank you for the idea! Laura how much longer did you have to cook them for the full size muffin? Glad you loved them, Laura! Thank you so much, I made a batch of these on Monday evening and we finished them yesterday– delicious! I think I will try them with blueberries next time. I just discovered your blog via Pinterest, and am so excited to try your recipes! As a WW member, the points plus values are SO appreciated! emily, youve inspired me to start cooking right, and to count WW points! I found your website via Pinterest too, and thank god i did. cooking healthier would really help me and my family. thank you! That has to be the coolest idea ever! I brought these to work for an office food day, and they were a HUGE hit. Even after I told them that they were WW friendly. I did banana and blueberry, but I agree, the banana are by far the best. Thanks so much for your recipes…keep em comin! These were a big hit, and I loved that I had all the ingredients in the house so I could surprise my boys on a Sunday morning. I had planned to freeze the leftovers and report back on how they reheated, but I don’t think the boys left any. Will try again and give an update. Thanks! Thanks, Lori! Glad the boys loved them. I would love a report back about whether they freeze well, so if you try it, let me know! You can spray paper cupcake liners just like you would the pan to avoid things (like these or cupcakes either one) from sticking. I learned that from a bakery and have been doing it for years. These were fantastic!!!! I LOVED the banana and the sausage ones the best. Thanks for sharing. I made them last week and the sausage and bacon ones lasted in the fridge, the bananas turned a little brown but tasted great after a few days. Yay, I am so happy you loved them, Melissa! My banana ones disappeared into my mouth before I could judge how they’d last in the fridge after a few days ;). Glad to hear these were a hit! Made these this morning- YUM- and soooo easy! Thanks! Will def be making again! Yay, happy they were a hit! Making these now …hope they turn out delish!!!! New to WE appreciate your website!! I hope you love them, Stephie! So easy, so delicious! This is a keeper for sure, and will definitely be added to my breakfast “go to” list 🙂 Keep ’em coming!! I made these and LOVED them! Feels like a cheat! I’m so glad you loved them, Sarah! Oh my. Not only were these delicious for brunch, but they also completely saved my morning – I grabbed a few and reheated on my way out the door, and could have sworn I was having brunch again instead of eating breakfast in my car. Thanks for a great recipe!! Keep the muffin-esque recipes coming! Yay! I’m happy these were such a big hit. Thanks for letting me know! Do you know how many points in a regular muffin pan? Nope, sorry. I only made them as minis! I made them in a regular 12 count muffin pan. I used the exact same ingredients and I did the recipe builder on WW. They actually come out to 1 WW point as well. I made these last night! I didn’t have a mini muffin pan so I just added 5 minutes to the baking time for my full size pan and they were great! The recipe only made 8 full size muffins so I’ll definitely double it next time. Made these for breakfast today. I added some chopped walnuts to half for my husband – both ways were delicious! Sooo easy and even more delicious! I will for sure be making these again! Have you made them in the microwave? And if so how do you? I have definitely never made these in the microwave. I recommend using the oven! We tried dipping apples into pancake batter to make apple pancake rings. It works for small gathering. Your way of making “pancake” saves tons of time for big group. Awesome idea! Thank you for creating it. Do you think this will work with other fruits such as peaches, apriocot or strawberries? I made these this morning! We used a regular sized muffin tin and cooked for 17 minutes. Super easy to make, little mess to clean up, and my kids loved it! if you have a pancake mix on hand that uses milk eggs and oil do you use those ingredients also or just the milk and syrup? I have no idea, I have only ever made these the way I posted. I recommend using Bisquick! I used regular pancake mix today but not with the milk & eggs. Instead of using Bisquick, as the recipe calls for, you just substitute the pancake mix. I made this with regular pancake mix instead of Bisquick and mixed fresh strawberries right in the mix and it was yummy. This recipe is definitely a keeper. Mmm, I’m going to have to try this with strawberries. Glad to hear regular pancake mix works too. thanks for posting that! I’m in Canada and can’t get Bisquick Heart Smart Pancake & Baking Mix is there a home made version of it I can make? Hm, I’m not sure. One of the commenters above said they substituted regular pancake mix and that worked fine…maybe you could try that? These have become a favorite in our house. Today I did a taste test of three different kinds: banana, banana with a few chocolate chips, and blackberry. The blackberry ones were delicious and tasted like little muffins. But not surprisingly, the kids chose the banana with chocolate chips. I put four chocolate chips per mini-muffin, so not too much. In total poor taste to rip off someone else’s creation and not even link it to their site properly. Also to not bother to respect her wishes to not use her recipes BUT to link it to her post directly. I would never intentionally not credit a blog appropriately when I adapt a recipe. It does appear that the link was broken but I fixed it. Not sure how that happened. I used totally different ingredients than the recipe I adapted it from, yet used her general concept, hence the adaptation. That is not ripping someone off. Thanks for bringing the broken link to my attention. Made these the other day and my whole family LOVES them! I had to make another batch the next day and will probably make them again today. My 2 year old woke up this morning begging for “anna cakes, mommy!” We’re going to the farmer’s market today and I think we’ll get some strawberries to try with them as well. Thanks for the great recipe!! Made these today. Did both banana and banana mini chips… Very good. Would using sugar free syrup be all the same? LOVE this recipe!!! It is a big hit with the little ones =). We decided to do blueberry and peaches w/ cinnamon. Delicious! I made these for my kids this morning & they loved them! My son said I was the best baker ever 😉 haha. Thanks for the recipe! How long would you cook them in a regular muffin pan? I saw these on the readers choice award and was so glad because it reminded me about that I had printed out the recipe but never made them! I mixed them up this morning (so fast and easy) and we looved them! The kids wanted to dip theirs in syrup but we all liked them a lot.♥ I can’t wait to try them with other fruits. These were seriously the best thing I have EVER made, everyone in our house agrees. They are amazing. YUM. Oh! I also made mine with Cracker Barrel pure maple syrup and it didn’t affect P+. And, I sprinkled with cinnamon since we were using as a desert tonight. Couldn’t find the bisquick heart smart mix at my grocery store or target, any other ideas?? You can use regular pancake mix if you like! Haven’t made these yet but will be doing so soon. I have some cinnamon chips that I’m going to try in mine also. I’ll let you know how they turn out. We had these last night and the husband loved them. Today I gave some of the leftovers to the baby and he went crazy for them. After they were gone on his tray, he scavenged the pocket on his bib for any crumbs he could find. I found you on Pinterest and LOVE this recipe. I have to admit, though, that I used real maple syrup. I doubled the recipe today and made 4 dozen. I used a combo of Bisquick Heart Healthy and a whole grain pancake mix that I had. One dozen each of the following flavors: banana cinnamon, fresh strawberry, mini chocolate chips, and speck (diced Italian ham). Delicious!!!! Thanks for the great idea- this is a new family favorite! Hey Emily, did you cook the sausage and bacon before you dropped them into the mix??? I made these with Hungry Jack Buttermilk Pancake mix and 1/4 cup of real maple syrup! YUM! (it’s all I had) According to WW recipe builder they turned out 1pt each just like yours or 7 bites for 6 points! YUM!!! I am going to share these on my website and link back to your site! Sound good? Thanks again! I don’t use box mixes, will my pancake recipe work? I can add the syrup to it. I will try it and let you know. I made these with Hodgesons whole wheat baking mix instead of bisquick and they definitely didnt seem sweet enough for me. You think that mix made that much difference? These are so yummy, I have made multiple times. Thank you for the wonderful recipe. Dumb question as I have been making and flash freezing these forever but I wasn’t doing weight watchers lol. I know fruit is free and so it’s 1pp+ it would be more points with sausage or bacon right even if it’s such a small amount? My now 15 month old has been eating tons of versions of these it seems like forever (I did see them on a different site first, but yay I have points for me now lol) but we bake 24 of one kind then another and another, flash freeze them and then pull them out heat them in the microwave and boom breakfast that day or a snack another and daddy and I steal them too! But since getting back on WW Emily I love your site for ideas! I use the recipe builder to determine the WW points, so fruit is not counted as free. It probably depends what sausage or bacon you use, but I doubt it would change. You probably have to run it through the recipe builder if you want to be sure though. Made these today and they were amazing! I used Carey’s sugar free syrup which did reduce the calories to 28 per muffin. I was wondering if you ever tried using unsweetened almond milk with these? Anyway have some packed for work tomorrow for my breakfast. Thanks your site is one of the best ever! I really liked these. I also used homemade apple butter & blueberry butter in some and the taste was great. I did have issues with them getting done any suggestions? I’ve never used unsweetened almond milk, so I’d recommend you run the recipe through the WW recipe builder with the ingredient changes you’re making to determine the points! These are WONDERFUL!! We eat them as mid-afternoon snacks. Every since I made the first batch, our kitchen has never been without banana bites!! Just made these for breakfast and they are AWESOME! Yum, yum. I added some cinnamon to the batter and made mine blueberry/banana. They are delicious! Thanks Emily!